Anya Wallington-Lardi is a current BA History student, based at the Penryn Campus. She talked to us about how volunteering with the British Red Cross helped her find out what she wanted to do after university. 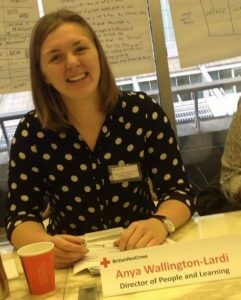 I first joined the British Red Cross as a volunteer during my First Year when I took part in the Aspirational Educators programme with the University of Exeter. This incredible opportunity allowed me to deliver humanitarian education sessions in local schools as a part of a team. After learning more about the humanitarian charity, I knew I wanted to be involved further. Since then, I’ve become a Fire and Emergency Support Services volunteer, a youth engagement volunteer, have taken part in schemes such as Takeover Day 2015 and the Humanitarian Awards 2016, and have started my own Red Cross on Campus group on Penryn Campus. Throughout these various experiences I’ve learnt a range of skills which has helped me to identify what I want to do. I’ve met a huge range of individuals including the CEO of the British Red Cross, MPs at Westminster, and volunteers who have set up their own charities in the Calais jungle. I’ve been able to ask a huge range of questions about the sector as well as been inspired by a range of role models, all of whom bring something special to the organisation. 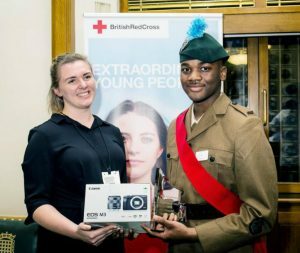 Anya presenting Jeremiah Emmanuel with his British Red Cross Humanitarian Award for saving the life of stranger who was stabbed near his home in May 2016. I’ve developed a range of skills through my volunteering; from interpersonal skills when helping those who have been victims of fire or emergencies, to team skills when discussing refugee policy in Takeover Day 2016. I’ve also grown in confidence as a result; I’m more comfortable as a public speaker since delivering Missing Maps volunteering sessions as president of the FXU Red Cross on Campus group, and feel more confident in my own career prospects. Networking and volunteering within such a huge organisation has taught me a lot about the opportunities on offer to young people wanting to get involved in the sector. I’ve learnt about their internship schemes, International Voluntary Service, and roles within the organisation. I’ve also been able to learn more about individual teams within the UK Head Office when I visited as a part of the Humanitarian Awards, and now know that I would like to work in the international development sector. What next? My experience with the Red Cross has been vast and varied and I have been able to develop skills and knowledge which has helped me identify what I want to do. I’m currently applying for postgraduate study in international development as well as graduate schemes in the charity sector.